With summer (and the hot sun) finally in full force, I have been wearing hats almost every single day to protect my skin and face. 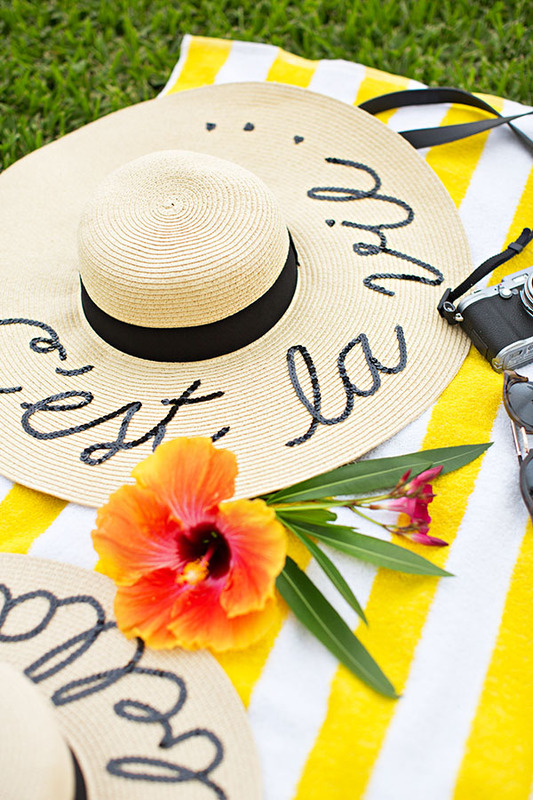 You may have noticed designer Eugenia Kim’s super adorable sun hats this season which feature clever phrases such as ‘Do not disturb’ and ‘Wish you were here…’ all spelled out in subtle black sequins for roughly $485 a pop. There is no denying their smart & fresh appeal. (Check them out HERE to see what I’m talking about.) I mean, who wouldn’t want to make a literal statement during your moments of utmost leisure? While there are many different moods you may enjoy expressing via headpiece, I am personally always in the kind of mood that likes to save money so I have more to spend on yummy Mai Tai’s. I’m sure I am not the only one with these particular priorities… so it is for this reason I am going to show you how to make your OWN for under $50. You’ll get all of the style and none of the buyer’s remorse once it’s covered in sand and sea spray. 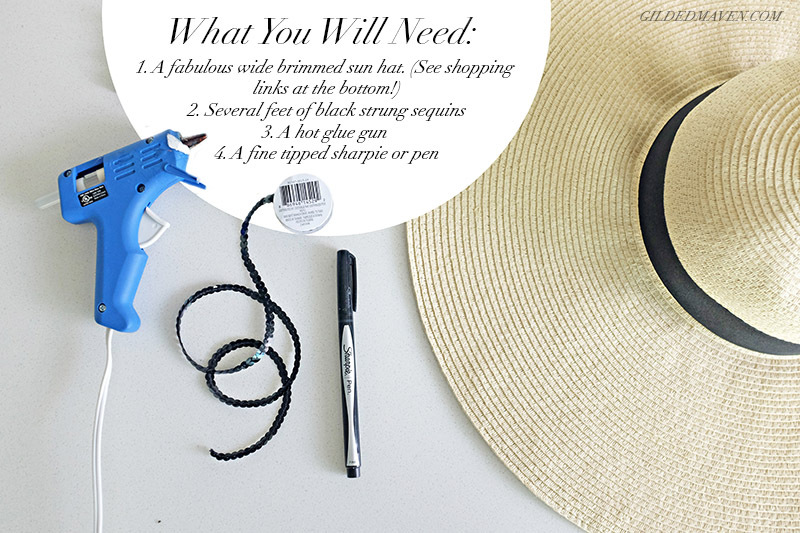 To recap, for this project you will need 1) A wide brimmed sun hat of choice (HERE & HERE) – I bought two different sizes so I could have more options during the summer 2) Several feet of black sequin trim (just get several rolls to be safe. 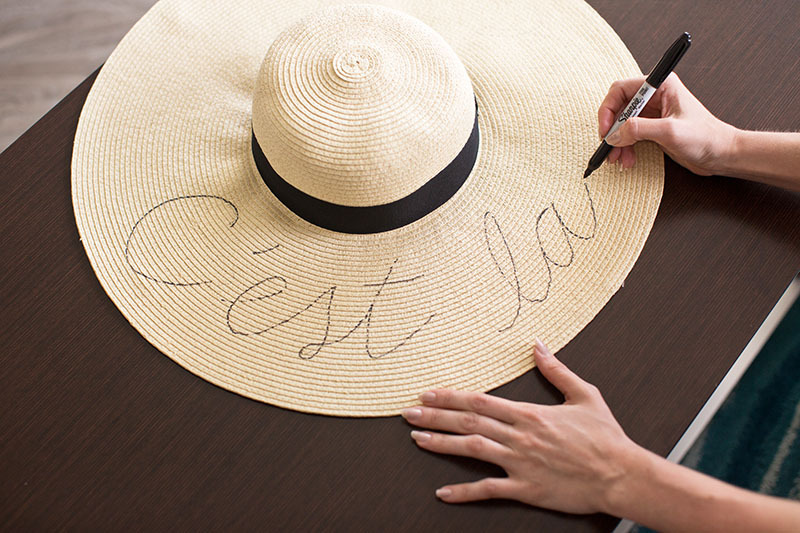 I have found it at Hobby Lobby in the past) 3) A hot glue gun and a few glue stick refills 4) A black Sharpie and pencil – OR – if you want to be fancy about it, get a disappearing ink fabric marker at the fabric store. First, on a blank piece of paper, practice writing out your phrase in loose cursive just to figure out how you’d like the letters to look. Don’t stress it. This is not calligraphy class and the penmanship should appear very relaxed. Not quite working out? Have a glass of wine and try again. The idea is to not try too hard. 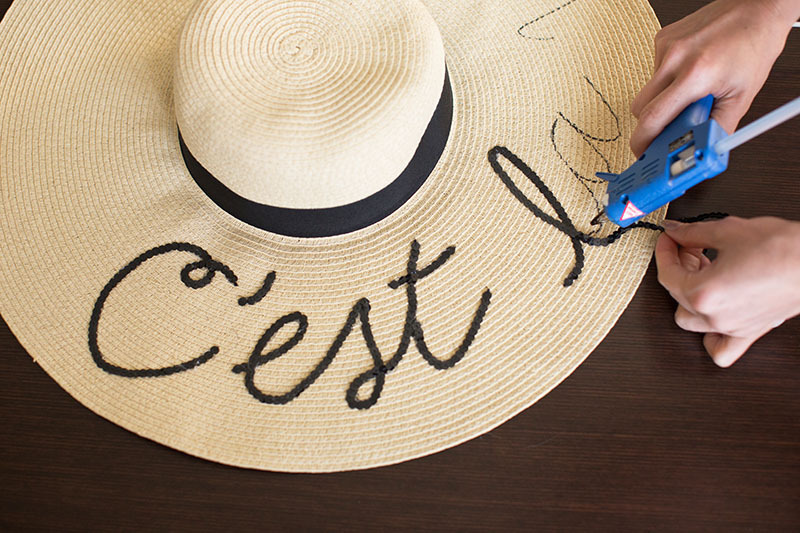 With a pencil, very lightly sketch the words onto the hat. 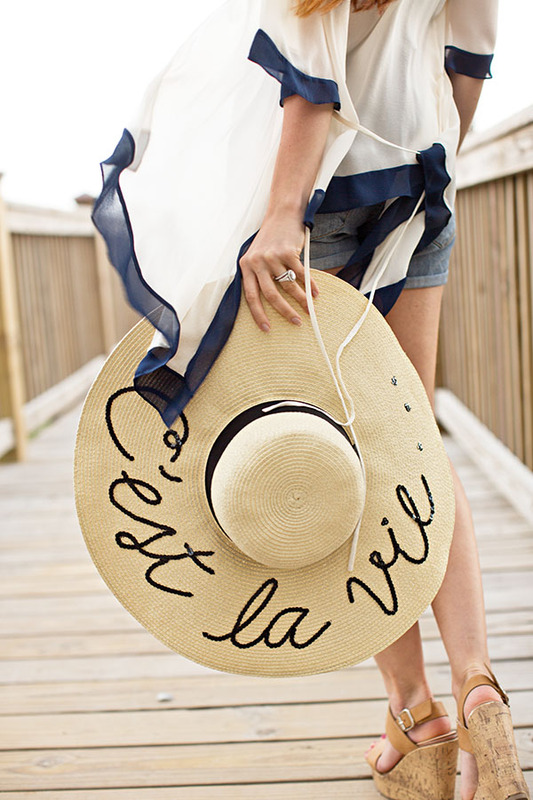 The phrase can be worn on the side or back of the brim, so if it isn’t perfectly centered it really won’t matter AT ALL. Once it is lightly written as you like, trace over it with the permanent marker to make it easier to see. (I did this so if I had any goof-ups with the pencil they’d be nearly invisible.) 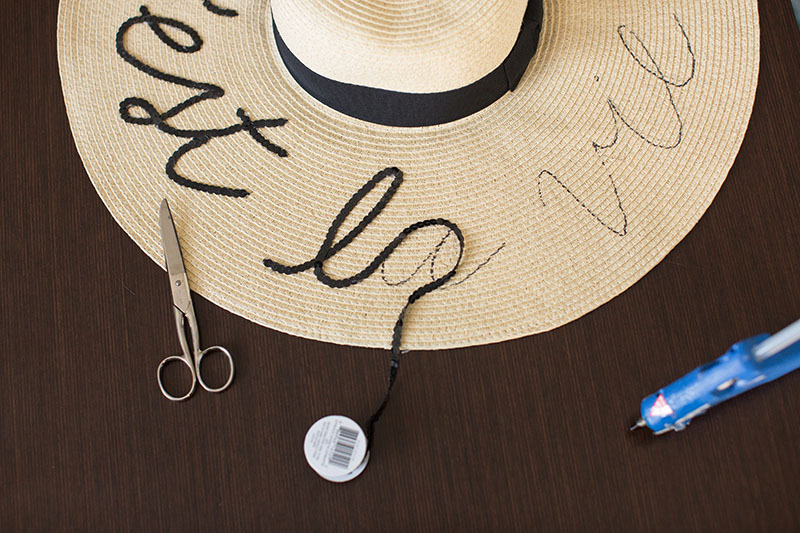 You can also use a disappearing ink fabric marker like this one to cover your tracks! Next, you are ready to get glueing. In 1-2″ sections, lay a line of hot glue and adhere a piece of sequin trim. Work in very short sections as the glue cools very quickly and you want to achieve a good bond. The sequin trim can and should overlap at times to achieve a casual, handwritten look. Occasionally you will need to cut the trim to begin a new letter or section. Do not stress the annoying hot glue ‘strings’ and mess. Just pick it all off once you are finished! Voilá! Now go travel and be fabulous! Even if you’re only traveling into your back yard with a glass of iced tea, the summer will taste much sweeter with all you saved! Now you’re probably coming up with all KINDS of ideas… Bridesmaids gifts? A great craft project for an all-girl’s trip perhaps? OH the FUN! Add pom-pom trim around the top or even use gold or purple sequin trim instead to make it more festive! Just be sure you take photos, because you know I will want to see your creations! Thanks for reading! Let me know what you think in the comments and make sure you are following along on Instagram so we can stay in touch! Want to remember this for later? PIN IT to Pinterest! 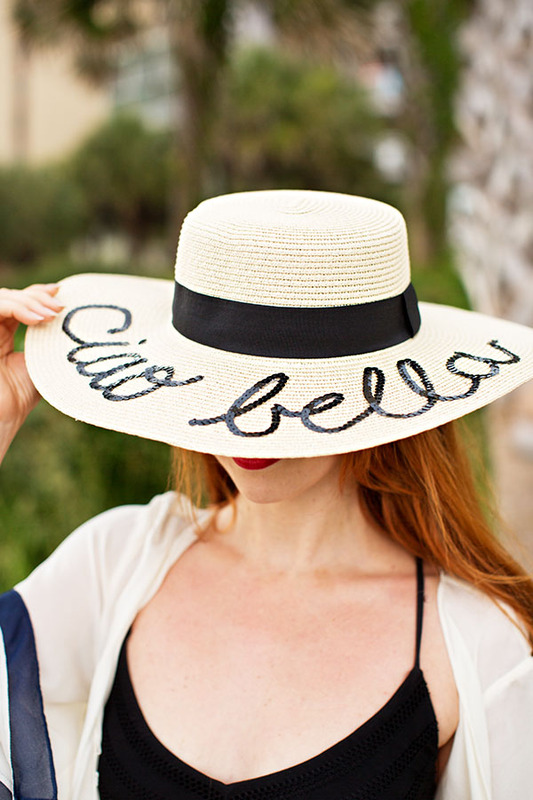 Ooh I have a red sun hat that could use some sprucing up… Great idea! YES! You should Bryce!! #GoCards! Well now I know what I’m doing this afternoon. Prepping for Mexico and can’t wait to make one. Now what should it say? 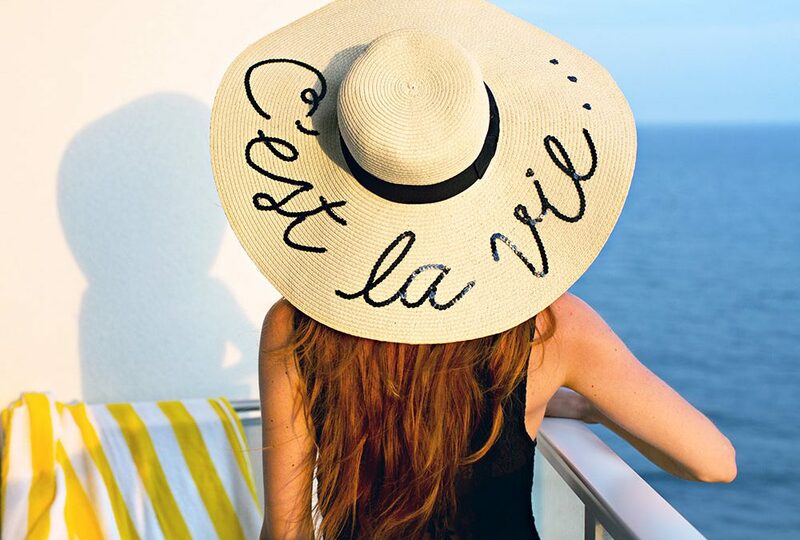 I like the C’est la vie hat and statement!! Thank you so much for the DIY! 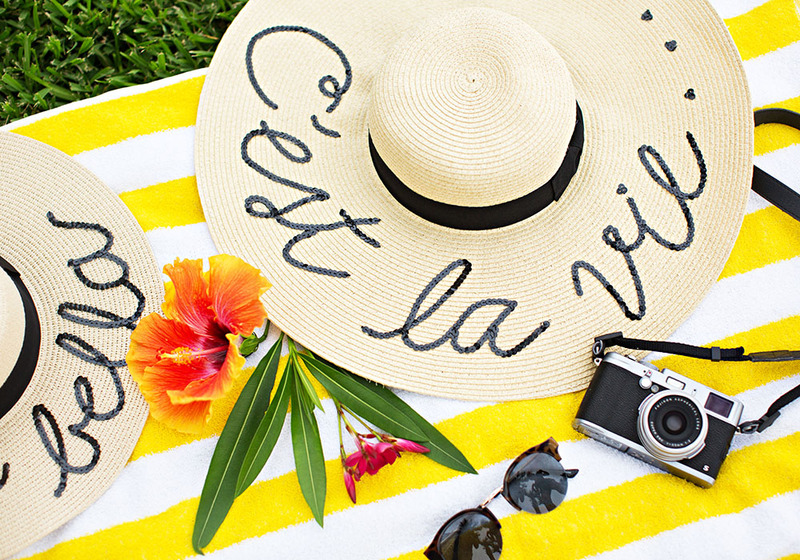 I especially appreciated the links to different sun hats & the photo step by steps! I have so many inspirations stemmed off this post! Thanks again! Can’t wait to see what’s next for this Spring/Summer!